I have the upmost respect for the support team but the lack of care in that response, I already knew nothing was gonna be done about it. Why dont they tackle something more important that has plagued VG for so long. Im not salty about the troll but its a problem that needs to be fixed honestly. 3minute lpq is fine and all but after that, it needs to be more severe. Im not going to ask for my Elo back but this dude really doesnt care about anything. He got mad that first pick chose Cp Kinetic and decided to Jungle Tank Saw with him saying “Time to troll”. I dodged cuz i didnt want to deal with his toxicity and the next match I managed to get him on my team again… This time i didn’t dodge cuz he wasnt trollin the the hero lobby but half way through the match, he decided to stay at spawn and not move. Can you for the love of god ban him. 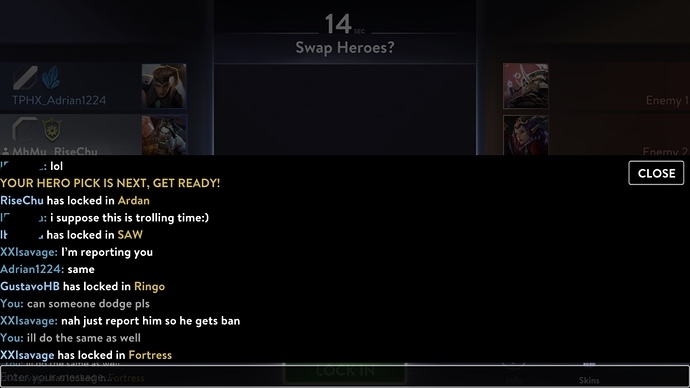 Not no 3 minutes lpq but a full ban. I even friended a random dude on our team who saw everything for proof. The tank meta is already annoying but now I have to deal with this? Ive been a player for a long time but it’s annoying to see the karma system not punishing effectively for the real trolls that need it. •Hopefully it doesnt happen again. •We’ll try to make the system better. •We cant tell you the punishment that will be given. -which is the #1 thing i wanted to know. But I understand. Yeeeeeessssss trollers need to be punished accordingly, especially with such damning evidence. They ruin the game for everyone. a little bit off topic but he still the leader of Infamous?